In 2016 the BBPA granted 46 new and renewable scholarships valued close to $150,000. Over the past 30 years the BBPA Scholarship Fund granted approximately 950 scholarships totalling $3.6 million. For 2016 we welcomed the following first time donors: The Toronto Police Chief Mark Saunders, Sun and Partners and D’Juvayne Christian. We are especially grateful to those organizations and individuals who have made a generous gift to our endowment fund. Thanks to Dr. Miriam Rossi and Renato Rossi for their generosity in funding four or more scholarships consistently, for so many years. We thank all our sponsors for their contributions to the education of Black youth through the BBPA National Scholarships. First Generation Scholarships of $1,000.00 to $2,000.00 are available to students whose parents have not participated in post-secondary education studies. 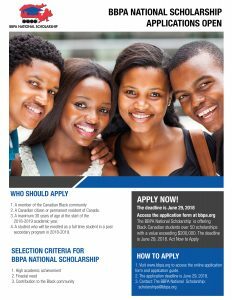 Qualified students must be residents of Ontario and must meet all other eligibility criteria of the BBPA National scholarships. First Generation Scholarships are funded by an endowment established with the proceeds of a grant from the Government of Ontario. THE BEST LIFESTYLE RESIDENCE SCHOLARSHIP (1) This $1,500.00 scholarship is sponsored by Ms. Pauline Christian, President of the BBPA in memory of her mother the late Queen Victoria Wellington-Wint. Scholarship to be awarded to a student with strong academics, health/fitness consciousness, demonstrated financial need, and who has made a recognized contribution in his/her community. Ms. Christian will participate in making the decision regarding the recipient of her scholarship. THE D’JUVAYNE CHRISTIAN (1) is a $1000.oo scholarship sponsored by D’Juvayne Christian, for a student interested in entrepreneurship or Real Estate Investments. The student must be entering first year postsecondary studies, with strong community involvement, academic record and financial need, in this order stated. 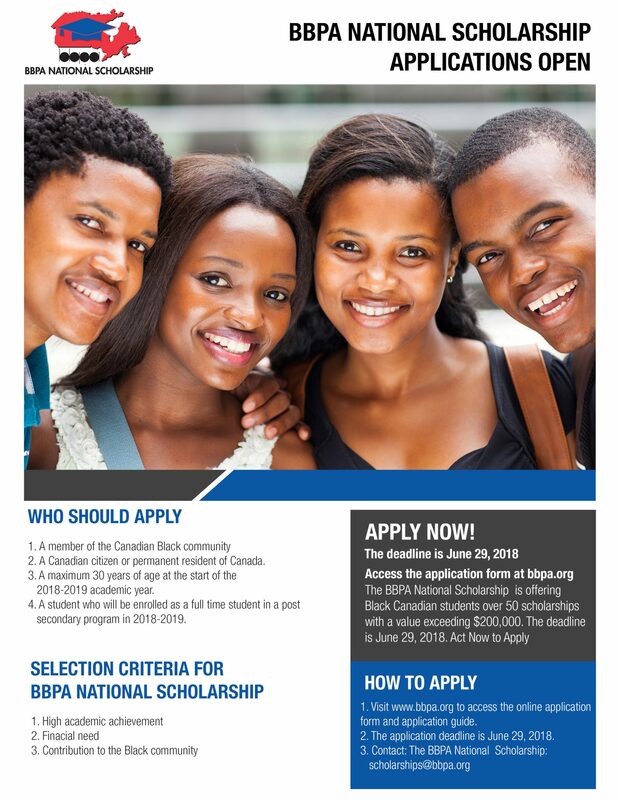 The successful applicant would meet the BBPA’s National Scholarship Fund eligibility criteria as well. Mr. Christian will participate in making the decision regarding the recipient of his scholarship. THE HARRY JEROME LEGACY SCHOLARSHIP (1) is a $2000.00 scholarship sponsored by the BBPA to honour Harry Jerome, an outstanding Black Canadian who was an Olympian, Officer of the Order of Canada and world renowned for his sports achievements. Equally respected for his dedication to educational and athletic opportunities for youth, Mr. Jerome was invited by Prime Minister Pierre Elliott Trudeau to help create and serve as a senior administrator in the Canadian Ministry of Sport. Reflecting this criteria, this scholarship is to be awarded to an applicant 18 years or older who has demonstrated superior achievement in academics, athletics and his/her involvement in helping those who need, assistance or support in the Black community. THE ROBERT SUTHERLAND/HARRY JEROME ENTRANCE AWARD: established in 2008 by Queen’s University in cooperation with the Black Business and Professional Association (BBPA),and the former Harry Jerome Scholarship program, to honour Robert Sutherland (BA, 1852), the first student of African heritage to graduate from Queen’s University, Ontario, Canada. 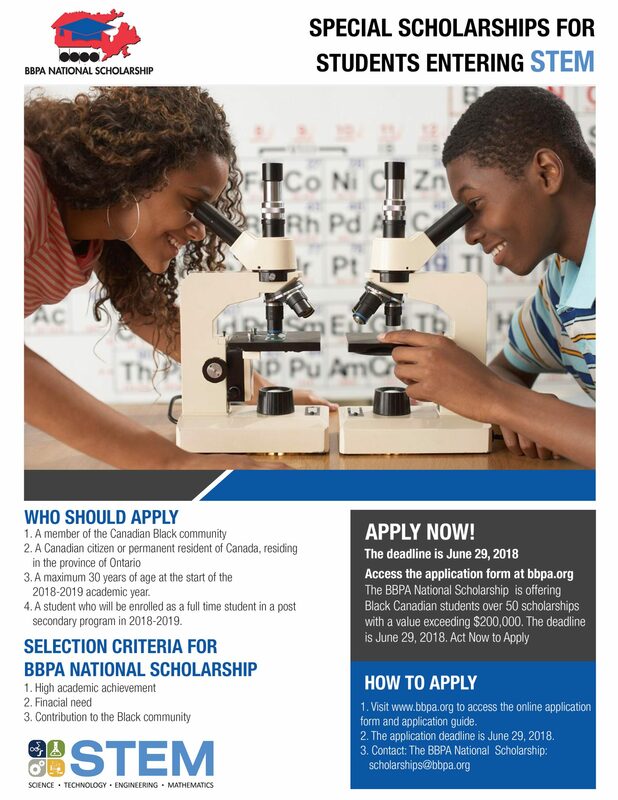 As per Queen’s University, the funded scholarship is awarded to a Black student entering the first year of any direct-entry undergraduate degree program at Queen’s University, on the basis of demonstrated financial need, academic achievement and contribution to the community or other volunteer activities. Application should be made to the Associate University Registrar (Student Awards) by March 1. Value $5,000.00 renewable for three years, providing a satisfactory academic average is maintained each year and financial need continues. Students apply to Queen’s University directly and are chosen by a committee of the Student Awards Office at Queen’s University. THE C.I.B.C. SCHOLARSHIP (1) This scholarship of $5,000.00, sponsored by CIBC, is to be awarded to a student with demonstrated social responsibility through work in the community. Successful candidates may be enrolled in a course of study leading to a bachelor’s or master’s degree in Business Administration or a related program. THE ALRICA GORDON SCHOLARSHIP for $2,000.00, (1) is sponsored by Mr. Konata Lake, former recipient of more than one BBPA scholarship. He sponsors the scholarship in honour of his mother, Mrs. Gordon, for her support through his many years of studies. Mr. Lake has asked that the scholarship recipient be a graduate of C.I., C.W. Jeffreys, Emery Collegiate Institute, or of other Jane-Finch at-risk high schools in Toronto. THE DR. OUIDA M. WRIGHT MEMORIAL SCHOLARSHIP (1) Sponsored by Dr. Leebert A. Wright in the name of the late Dr. Ouida M. Wright, who had a lifelong aspiration for higher education and who aided and inspired thousands of young people to make education a worthwhile goal. This $4,500.00 scholarship will be awarded to a female student who has been accepted into a post-secondary degree program in one of the sciences such as mathematics, physics, chemistry, biology or medicine. THE TORONTO POLICE CHIEF MARK SAUNDERS SCHOLARSHIP (1), for $1,000.00, sponsored by the Toronto Police Police Chief Mark Saunders, Toronto Police Service’s first Black Chief of Police. The scholarship is awarded to a student enrolled at an accredited university or college in Canada as a full-time student in diploma or degree program leading to a career in law enforcement. 3. The Portia White Scholarship, in the musical arts (1) in honour of the late Ms. Portia White, a renowned opera singer in past decades, who overcame personal obstacles to establish an outstanding musical career. FIRST GENERATION SCHOLARSHIPS: First Generation Scholarships of $1,000.00 – $2,000.00 are available to students whose parents have not participated in post-secondary education studies are granted to individuals who are the first in his/her family to attend university. Students must be residents of Ontario and must meet all other eligibility criteria of the BBPA National scholarships. First Generation Scholarships are funded by an endowment established with the proceeds of a grant from the Government of Ontario. THE TORONTO COMMUNITY HOUSING / LEADERS OF TOMORROW SCHOLARSHIPS: Four Toronto Community Housing / Leaders of Tomorrow scholarships valued at $1,000.00 – $2,000.00 each are available to students from high priority neighbourhoods in the Greater Toronto Area who are attending an accredited Canadian university or college. THE HARRY GAIREY SCHOLARSHIP: (1) for $2,000.00, is sponsored by the BBPA, in honour of Mr. Gairey’s important role as a community activist and his many valuable contributions to the Black community over the years. THE HUMANITARIAN SCHOLARSHIP (1) $1,000.00 is for a student at risk of being forced to leave his/her studies due to exceptional financial need and no possibility of other financial help. Sponsored by BBPA. THE MADELINE BLACKMAN SCHOLARSHIP is sponsored by a group of Antiguans and Barbudans forming the Madeline Blackman Scholarship Committee. A $3000 scholarship is granted to a student that is from the Antigua and Barbuda community, has a positive academic performance, studies in the arts or fine arts, and has a financial need.